These are Barack Obama's leads in the likely voter models presently included in the Real Clear Politics average, plus the Research 2000 poll which they arbitrarily exclude. The polls in the Cingular-y orange color include cellphones in their samples; the polls in gray do not. 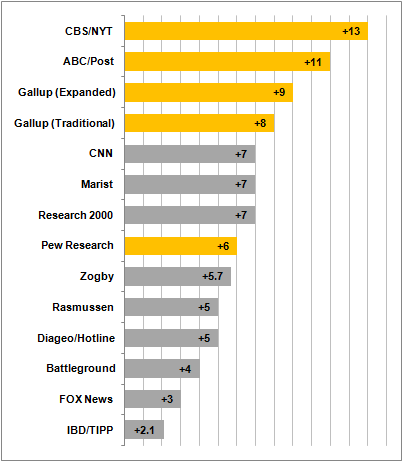 The cellphone polls have Obama ahead by an average of 9.4 points; the landline-only polls, 5.1 points. I did a radio hit the other afternoon with Mark DeCamillo of California's vaunted Field Poll, which does include cellphones in their samples. He suggested to me that it was much easier to get the cooperation of cellphone users on the weekend than during the week. How come? Because most cellphone plans include free weekend minutes. Conversely, one might expect that young people are particularly difficult to reach on their landlines over the weekend, since they tend to be away from home more (especially on a weekend when some nontrivial number of them are out volunteering for Obama). So, while I haven't tried to verify this, it wouldn't surprise me if the "cellphone gap" expands over the weekend, and contracts during the week.